Culler Plumbing: Clearing Clogged Drains for over 20 Years. Call Now! There you are, standing in an inch of dirty shower water in your tub because the water is draining out so slow. This happens every so often, no matter what kind of hair trap you use. You know it’s only a matter of time before your bathroom sink also begins to drain slower. You have a clogged drain. On your next grocery shopping trip, you’ll pick up a gallon of chemical drain cleaner and hope it does the trick. In this scenario, the best thing you can do is call a professional. If you insist on being a do-it-yourselfer, here are a few tips to help clear that clog in the drain. There are plenty of home drain cleaner recipes you can try. My favorite is baking soda and vinegar. This magic recipe will fizz, and it is that reaction that will help break down whatever is clogging the drain. Mix equal parts baking soda and vinegar, you must be ready to use the mix immediately. To avoid inhaling too much of the smell, I like to pour the baking soda directly into the clogged drain and then pour vinegar into it. If you don’t have vinegar (or just can’t stomach the smell), you can use equal parts of salt and baking soda. Pour the mixture into the clogged drain and allow it to sit for about 15 minutes, then follow with boiling water to relieve blockages. Although both of these home recipes are great, for some of the nastiest clogs, the effect may not be enough. If the clog is particularly nasty, use the baking soda and vinegar mixture and then cover with a stopper. Allow the concoction to sit while you fill the tub or sink. After about 45 minutes, pull the plug and allow the force of the collected water to push the clog forward. Don’t pigeonhole your plunger to exclusively clearing toilet clogs. The plumber’s best friend is also great for clearing sinks and tubs, where the water is supposed to go down, the plunger can work! It may take a few attempts, so give it a few tries before moving on to the next solution. Be careful not to plunge so hard that you get splash back. Always plunge with your mouth closed! This tip is exactly what it sounds like, getting in those pipes and cleaning them out. Sinks are designed with a U-shaped curve in the pipe between the wall and the connection to the sink. You may be tempted to replace the U with a straight pipe, but that would be a very poor life choice. This area is the biggest culprit for collecting debris that creates clogs, but is critically important to preventing the backflow of water from the sewer, where the water drains to. 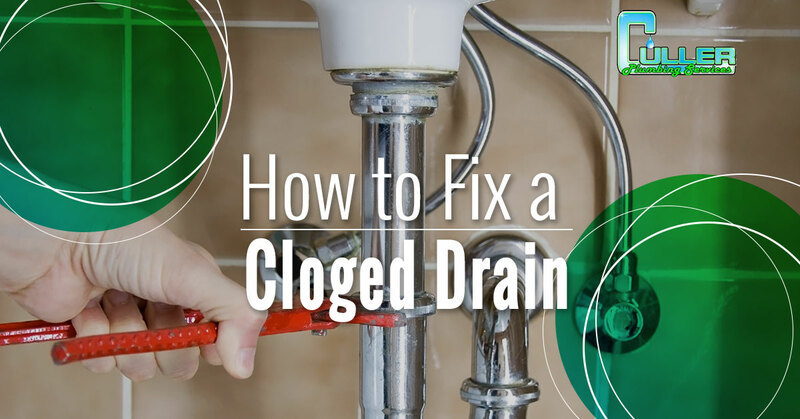 To clear clogs here and clean the pipes, you’ll need a plumber’s wrench and a bucket. Before you get into it, make sure to turn the water off! Place your bucket underneath the U-shaped part of the sink drain. Use the wrench to loosen the nuts on either side of the U until you can wiggle it free. You should be able to pour debris out and clean the pipe now. Once you are done, replace it the same way you took it out. When all else fails, it’s time to call in the professionals. At Culler Plumbing, we have have been providing exceptional service to Clair and Madison counties for over 20 years. There isn’t a drain that we can’t unclog! Call today for your estimate or to have one of our emergency plumbers come fix the mess!